MoDOT requires the use of Bentley SS4 Power GEOPAK software for highway and bridge design. SS4 Power GEOPAK is based on a 3D workflow. Throughout the entire project design, MoDOT Design staff and design consultants shall produce Electronic Design Data using Bentley’s SS4 Power GEOPAK as defined in this section. Any conversion process from another CADD package to SS4 Power GEOPAK Electronic Design Data is not acceptable. Please refer to EPG 237.14.5 Glossary of Terms for the MoDOT definition of italicized terms as they apply to this document and the delivery of Electronic Design Data for MoDOT projects. Electronic Design Data requirements pertain to road design, bridge design and survey projects. These electronic deliverables are now referred to as Electronic Design Data (EDD). A subset of this information is then posted on the MoDOT Online Plan Room for use by potential bidders. Electronic Design Data is required for all MoDOT and consultant designed projects, but varies by project type. (See Table 237.14.2 for requirements). 1 All Electronic Design Data shall follow the file naming convention outlined in EPG 237.13.2 Electronic Design Data. This Excel report, prepared by the designer, gives a summary of all Electronic Design Data files submitted with the project and is an important reference for MoDOT staff and contractors that may use the Electronic Design Data. This file contains specific project information and acts as table of contents with descriptions for all files submitted. The Project Data Summary Report shall be provided as a Microsoft Excel file (.xlsx). The Survey Report is prepared by the project’s Professional Land Surveyor of Record. It is used for documenting the project control metadata and the method in which the topography and terrain information is obtained for a project. A Survey Report Example is available. The Survey Report shall be provided as a Adobe Acrobat file (.PDF). The comma delimited Survey Coordinate File is prepared by the project’s Professional Land Surveyor of Record and contains project control points. Please ensure that all control points share the same modified state plane coordinate system projection factor and vertical datum. Include the projection factor and vertical datum in the survey report. A Survey Coordinate File Example is available. Comma Separated Value file (.CSV) in the format: pt. no., n, e, z, descr. The existing surface and mapping is prepared by the Professional Land Surveyor of Record and is the basis for roadway design. Both the Existing Ground surface (stored as a SS4 Power GEOPAK terrain model) and the existing topography mapping is stored in the Power GEOPAK .dgn file. The terrain model is produced from traditional survey methods, aerial acquisition, laser scanning or a combination of methods using appropriate MoDOT surface feature definitions. The project projection factor and vertical datum are documented in the Survey Report. Survey data must be process through Bentley’s SS4 Power GEOPAK Survey Tool located in the Project Explorer > Survey tab. - Access is available to the video Creating the LandXML File (Exporting Existing Ground Terrain To LandXML) . 1 MoDOT utilizes LiDAR to capture existing conditions; these are large files and may exceed the limit of LandXML file creation. If the file size is too large to export via LandXML 1.2, the existing ground surface must be broken into multiple sections. Please contact CADD Support for additional information. The Civil Geometry File, prepared by the designer, contains all horizontal and vertical alignments used in the development of the design. Horizontal alignment examples include: baselines, special ditches, etc. Vertical alignments include: baseline profiles, special ditch profiles, retaining wall profiles, etc. The Civil Geometry File should not contain any preliminary or unused alignments. All geometry contained in this file shall follow the file naming convention for the designed Linear Features (i.e. Alignments and Profiles) found in the plans. A summary of all geometry shall be captured in the Civil Geometry Report. - Access is available to the video Creating the LandXML file (Geometry to XML CC). The Civil Geometry Report, prepared by the designer, can be produced by using the style sheet report “MoDOTHorizontalandVerticalAlignmentReviewReport.xsl”. This report is available in the MoDOT SS4 Power GEOPAK workspace. The Civil Geometry Report shall include all horizontal and vertical alignments that make up the project. (For example: roadway baselines and profiles, radius returns, special ditches, etc.). Access is available to the video, Creating the Civil Geometry Report, that shows the steps to assemble a Civil Geometry Report. Corridor files, prepared by the designer, consist of items such as templates, corridors, edges of pavement, shoulders, curbs, gutters, sidewalks, retaining walls or any other feature used in the dynamic generation of a 3D model. Multiple corridors are often required to model a roadway corridor. Produce cross sections at template drop locations. Earthwork quantities computed from the cross sections are satisfactory. Pavement and shoulder elevations and locations are accurate. The Corridor File(s) shall be provided as a SS4 Power GEOPAK file (.dgn). This terrain model, prepared by the designer, represents the entire proposed finished grade surface which includes but is not limited to fore slopes, back slopes, ditch bottoms, roadway surfaces, etc. It can be created using the MoDOT graphical filter: “Design - Proposed Finished Grade“. Access is available to the video Creating the Design - Proposed Finished Grade Terrain Model. - Access is available to the video Creating the LandXML file. These SS4 Power GEOPAK files, prepared by the designer, are used to generate ALL signed plan sheet Adobe Acrobat contract documents. Each sheet file must be provided with any associated reference files (.dgn, imagery, etc.) that are attached to produce the final signed plan sheet .pdf files. The Plan Sheets plus References shall be provided as a SS4 Power GEOPAK file (.dgn). These are Adobe Acrobat files, prepared by the designer and signed by the Project Manager, that represent the plan sheets created in SS4 Power GEOPAK. The Acrobat Files can be produced by MoDOT staff in bulk using the ProjectWise PDF Creation Tool. Files created by this method are automatically placed in the appropriate ProjectWise location where they can be signed by the MoDOT Project Manager. Signed consultant contract documents will be uploaded to the appropriate ProjectWise location by the MoDOT Project Manager after delivery. Access is available to the video ProjectWise “Make PDF Request” process for Highway Design Plans and Bridge Plans. After design and project review is completed the Electronic Design Data must be organized and submitted to the Bidding and Contracts Section. The following steps must be performed so that projects can be advertised by the Bidding and Contracts section. Ensure Adobe Acrobat plan sheets (.pdf) are complete and signed. Organize project files and eliminate unused SS4 Power GEOPAK data. All Electronic Design Data used in the development of the contract plans is stored in ProjectWise during all design, construction and post construction phases. A subset of Electronic Design Data is packaged in a file called Job#_EDD_info.zip, by the designer, for posting on the electronic plans room. The zip file is placed in the “Contract Plans” folder within ProjectWise at the time contract plans and other plan, specification and estimate (PS&E) documents are completed. The naming convention and other guidance for the creation of the zip file are provided in EPG 237.9 Submission of Plans and Supporting Documents. The MoDOT Project Manager has the responsibility to ensure all data is accurate and represents the contract plans as signed. Contractors are not provided all Electronic Design Data as specified below. Unnecessary document and data files not required for bidding or construction. Signed plan sheets and cross section sheets (.pdf). Consultant Electronic Design Data is typically submitted to MoDOT via DVD or download. It is then uploaded by MoDOT by the Project Manager to ProjectWise and stored in the same location and project structure as any other MoDOT project. The delivered consultant SS4 Power GEOPAK files should be processed by MoDOT staff with the ProjectWise Ref Scan Tool so that all broken reference file links are repaired. The Electronic Design Data should be reviewed for completeness and manually checked for broken reference file links. Any problems should be resolved. Once all deliverables have been reviewed and accepted, the Project Manager then submits the Electronic Design Deliverables according to EPG 237.14.3.1 Preparation of Electronic Design Data and EPG 237.14.3.2 Submittal of MoDOT Designed Projects. MoDOT Bidding and Contracts has developed a web site to allow contractors and plans providers to easily download the bidding documents and Electronic Design Data. The Electronic Design Data zip file as well as the signed Adobe Acrobat plan sheets (.pdf) are accessed by Bidding and Contracts staff using ProjectWise and then will upload to the online plans room. Other non-CADD contract documents are accessed by the Bidding and Contracts section via SharePoint and are uploaded to a different section of the plans room. See also EPG 237.9 Submission of Plans and Supporting Documents. General Provision Electronic Information for Bidder's Automation (page 24 of this link), of the Missouri Standard Specifications for Highway Construction, provides information for bidder automation. If provided, the Electronic Design Data does not constitute part of the bid or contract documents. This information, used for project design and quantity estimation purposes, is provided for the bidder’s use in automation of bid estimating, contractor furnished staking, automated machine guidance and other construction methods. Construction staff requires Electronic Design Data for constructing the project, checking quantities, and producing as-built plans. 1. By the request of the Resident Engineer to the Project Manager, all Electronic Design Data will be made available to Construction Staff. This request should be done at or around the Pre-Construction meeting. 2. Project Manager instructs District Design staff to prepare files for transfer, see EPG 237.14.3.1 Preparation of Electronic Design Data. 3. If ProjectWise is utilized in the Project Office: District Design staff will request the Electronic Design Data via the “PW Access Group” at pwaccess@modot.mo.gov with the following information: District, County, Job Number, and name of Project Office receiving the files. Electronic Design Data then will be copied to the Construction folder within ProjectWise by CADD Services Staff. 4. If Project Wise is not utilized in Project Office: District Design staff exports the completed project from ProjectWise using the proper settings to preserve reference file links. See How to Export a Completed Project in ProjectWise to Construction. District Design staff will then request their District Information Systems staff to move (not copy) the exported EDD files to the Project Office’s server on the ustation share (t:\drive). 5. SharePoint SHOULD NOT be used in any way for the transfer of SS4 Power GeoPak data. SS4 Power GEOPAK does not function when accessing files via SharePoint because it is unable to resolve any reference file links. The Project Office may also obtain the files that are provided to the contractor via eProjects. Note: To search for documents within eProjects, enter the Job Number minus the "J" in the search box in the upper right-hand corner and hit "enter". MoDOT drawing standards are provided to consultants to create a SS4 Power GEOPAK workspace that exactly matches the workspace used internally by MoDOT staff. These standards, when used in conjunction with SS4 Power GEOPAK help ensure that drawings provided meet MoDOT requirements. 1. The consultant shall furnish to MoDOT all of the contract plan drawings, for an entire project as SS4 Power GEOPAK drawings (DGN format). The consultant is responsible for verifying with MoDOT Design CADD Services for the current software version. All associated files that are attached to the drawing such as cell libraries, line definitions, dgnlib and reference files must be included if not automatically embedded in the file. The use of Microsoft Excel spreadsheet program can be used to create quantity summary sheets, however, any type of linking between the files to the contract plans is not permitted. 2. All design elements of the project shall be designed and delivered to the department in SS4 Power GEOPAK format using the current MoDOT workspace. 3. Each drawing file that is part of the final contract set shall be a full size plan sheet of 22 in. x 34 in. (560 mm x 865 mm) nominal size. All images shall be within a border of 20.375 in. x 31.25 in. (520 mm x 800 mm). The border shall be centered on the plotted page to ensure no part of the drawing is cut off during reproduction. Other than cross-section sheets, there shall be one SS4 Power GEOPAK drawing file that corresponds to each sheet of the plan set as submitted. The consultant may provide all cross-section sheets in a single SS4 Power GEOPAK file but must reference MoDOT’s border to each individual sheet. 4. The plan drawings shall be to a represented scale. The geometry shall be within a 2D file and consist of vector lines. Drawings shall be created in real world modified state plane coordinates at a 1 to 1 scale where applicable and plotted to the represented scale. 5. All drawings shall be self-contained or furnished with the supporting library of symbols and details to make the drawings complete in the format provided. MoDOT plots all drawings in a WYSIWYG (What You See Is What You Get) format based upon a MoDOT specific border file attached as a reference file. The department will furnish the appropriate color table through its SS4 Power GEOPAK Drawing Standards internet site. All line style, cells and symbology are applied to the SS4 Power GEOPAK drawing and not modified at plot time. Drawings that require specific commercial plotting software to create plots that match delivered contract documents will not be accepted. All drawings must be fully reproducible in black and white. Screening, shading and use of grayscale on plans will not be accepted for final plans delivery. 6. MoDOT will verify the computer drawings using SS4 Power GEOPAK. The PDF contract plans will be checked against a SS4 Power GEOPAK drawing (DGN format), or vice versa, furnished by the consultant. 7. Drawings shall have a color table meeting department’s standards to simplify the transfer process. MoDOT will furnish the appropriate color table through its SS4 Power GEOPAK Drawing Standards internet site. 8. All drawings shall conform to department drawing standards as established in the MoDOT workspace. All drawings shall follow the department’s standards for names and colors and line weights as defined in the workspace. 9. Drawings shall be saved with the project number as the name of the parent folder and following the naming convention in EPG 237.13 Contract Plan File Name Convention. Subfolders can be used to improve organization. 10. Drawing files shall be submitted when all work covered by the contract is complete. Road project files shall be delivered to the MoDOT Project Manager. Bridge project files shall be delivered to the Structural Liaison Engineer responsible for the project. 11. Seed files and cell libraries are provided in the MoDOT workspace. The Missouri Standard Plans for Highway Construction are available in SS4 Power GEOPAK and Adobe Acrobat (.pdf) format on the department's web site. 1. All elements representing existing topography features shall be processed using the settings defined by the current MoDOT Survey Manager Database File (MoDOT_Power_GeoPak_SMD.xml) which is provided in MoDOT’s workspace. 2. All survey information supplied by the consultant shall be in compliance with EPG 238.1 Aerial Mapping and LiDAR Surveys. The feature codes used in the survey and photogrammetry information shall conform to the MoDOT standard feature codes as specified in the current MoDOT Civil Survey Style File (MoDOT_Power_GeoPak_SMD.xml). 3. The consultant shall utilize the MoDOT SS4 Power GEOPAK feature definitions as provided in the MoDOT workspace. 4. MoDOT provides a superelevation preference (SEP) file for the calculation of superelevation based on 2011 AASHTO standards. 5. Proposed cross sections shall be created from a corridor model. Cross section modifications should be avoided because edited cross sections would no longer match the corridor model. 6. MoDOT will provide a standard template library, civil cell library, and feature definition library. These files are available in the MoDOT workspace. 7. The consultant is required to use MoDOT SS4 Power GEOPAK standard libraries provided in the workspace. 8. The consultant shall submit ALL files used in the preparation of the roadway design. 9. Cross sections shall be provided in SS4 Power GEOPAK drawing file(s) that contain no other design data. The cross sections shall exactly match the Adobe Acrobat cross section sheet files (.pdf). 10. Cross sections sheets(.pdf) shall be submitted for but not limited to earthwork sections, entrance sections and superelevation transition sections. The superelevation transition sections included shall be at the following locations as described in Standard Plan 203.20 and Standard Plan 203.21: Section A-A (normal crown), Section B-B (0% superelevation), Section C-C (reverse crown) and Section D-D (full superelevation). 2D Point Feature. Power GEOPAK 2D Point Features are defined and stored in plan model. Contains no elevation (Z). 3D Geometry. Power GEOPAK 3D geometry is created in 3D model by mathematically combining the horizontal and vertical geometry to create 3D elements. These 3D geometry elements in turn define a design model. 3D Model. Created from linear features, corridor(s) and terrain models and resides in a Power GEOPAK dgn file. It is created and managed automatically. 3D Point Feature. 3D points can be defined in plan model or 3D model. They are stored in 3D model but represented in both plan and 3D (Power GEOPAK). Active Profile. The Civil Horizontal Element can have multiple profiles, the active profile is the one used for design and the creation of Corridors. The active profile is combined with the horizontal geometry to build a 3D element which is used in the 3D model. Active Terrain Model. One Power GEOPAK terrain model can be designated as “Active”. The active terrain model is the one used to display “existing ground”; in other words the one which displays automatically in a profile model when it is opened. The active terrain model is also the one which is targeted by side slopes unless the template defines a different target by name. Adobe Acrobat. The software used to create and view the portable document file (PDF) format. It can be read by any computer by using Acrobat Reader software without needing the program with which the document was originally created. Acrobat .pdf files can be viewed using Acrobat Professional, Acrobat Reader and BlueBeam Review. Acrobat .pdf files can be signed using Acrobat Professional or Acrobat Reader DC. Aerial Photography. Photographs of the ground from an aircraft in the direct-down position (see Nadir) or sometimes at an oblique angle. See Photogrammetry. Apply Surface Template. To applya Power GEOPAK corridor template to a terrain model for the purpose of creating components (such as pavement layers) under the terrain model. Arc Definition. Curve definition method generally used in roadway applications. The radius R is used to define the curve and is defined by the equation R = 5729.58/D where the degree of curvature D is the central angle subtended by a 100 ft. arc. Set in the Design File Settings > Civil Formatting under Radius Settings. See also Chord Definition. Back Slope. The slope up from the bottom of a ditch away from the roadway. Expressed as run:rise. Base Geometry. In many instances the Power GEOPAK geometry element will be trimmed. The original (or base), untrimmed element is always preserved as it is the storage for the rule. Baseline. A baseline is an alignment that is established for the design of road. A baseline is assigned stationing and contains no vertical information. The existing baseline shall be established by the PLS of record. Proposed baselines are usually established by the design engineer of record. Bentley. The company that produces MoDOT's roadway design software. Products include: Power GEOAPK, ProjectWise and ConceptStation. Bidding and Contracts Section. The MoDOT Bidding and Contract Services unit is responsible for letting MoDOT's highway construction and maintenance projects. This includes reviewing and advertising the projects, estimating, processing the letting, analyzing the bid results and providing a recommendation to management for award or reject of projects. Border. In MoDOT highway plans, the border is a reference file that is included in every sheet drawing. The border is what makes a Power GEOPAK drawing a sheet drawing. The aspect of the border (width to height ratio) will match the desired paper size which is typically 24" x 36". The size of the border determines the scale of the sheet. For example a 36 in. wide border at 100 scale will measure 3,600 ft. wide. The contents of the sheet is generally referenced in to the sheet drawing. The border is placed in the sheet drawing at the proper location, rotation and size. The reference files are then clipped so that they don't extend outside the border. The border file also contains the title block information. Boundary. Used to constrain the external boundary of the Power GEOPAK terrain model. No triangles are created outside the boundary. In addition, any point data outside the boundary is ignored. Break Line. A Power GEOPAK surface feature that represents a defined slope change (eg. EOP, EOS, Ditch bottom, slope breaks). No triangle side (in the triangulated surface) can cross over a break line. Break Void. A closed area of missing or obscured data. No tringulation inside the void. Bridge Survey. Bridge surveys are prepared and submitted to the Bridge Division by the district to provide the basis for preliminary bridge layouts and ultimately for the preparation of bridge plans by the Bridge Division. Information required includes: Plan sheet, Typical Section, Profile Sheet, Valley/Channel Sections, Cross Sections and aerial imagery. Cardinal Points. One of the points used to define the geometry of an alignment. Cardinal points include PC, PT, PI, and CC points for horizontal geometry and VPC, VPI and VPT for vertical geometry. Chord Definition. Curve definition method generally used in railway applications and in highway design before the mid 1900s. The radius R is used to define the curve, and is defined by the equation R = 50/SIN(0.5*D) where the degree of curvature D is the central angle subtended by a 100 ft. chord. See also Arc Definition. Civil Geometry File. This Power GEOPAK .dgn file contains all final horizontal and vertical alignments used in the development of the contract plans in .dgn or .xml format. Civil Geometry Report. This report will include all horizontal and vertical alignments that make up the project. Clipping Reference. Clipping allows you to remove areas of overlap when working with multiple Power GEOPAK corridors in a single surface. For example, in a corridor intersected by a crossing roadway, clipping would be used to remove all overlapped features within the intersection. Complex Terrain Model. A Power GEOPAK terrain model created by merging or appending two or more terrain models. Context Toolbox. When a Power GEOPAK element is selected, hovering over the element provides a heads-up and context sensitive toolbar which pops up at the cursor. This toolbar provides a few of the most commonly used tools which operate on the element selected element type. The first tool in this toolbar is always Quick Properties. Contour. A linear symbol representing points of equal elevation relative to a given datum. Contour, Major. The primary elevation line indicating a specific elevation in a surface model. Usually major contours are drawn with a heavier line weight or using a different color. Elevation text labels are usually drawn in association with major contours. Contour, Minor. A secondary elevation line indicating a specific elevation in a surface model. Minor contours are often drawn without special color or weight indexing and without elevation text labels. Contract Documents. Includes signed sheet drawings and specifications. Control Points. See Project Control. Coordinate File. A text file containing, at a minimum, x(E),y(N) or north(N), east(E) coordinate pairs and usually contains elevation values (z). These coordinates represent locations (points) on a plane. The file should be comma delimited but can be tab or space delimited and can contain additional colums of informaiton such as point ID, description or code. It is important to document the units, projection and vertical datum of the corrdinate data. Cross Section Sheets. The cross section sheets are byproduct of cross sections. Acrobat .pdf cross section sheet files are printed from the SS4 Power GEOPAK cross sections for the purpose of creating contract plans documents that can be signed. Cross Sections. SS4 Power GEOPAK Cross sections that are generated from the 3D Model and written into a .dgn file. Sections are not dynamic and must be re-generated after any design change. Cross sections can be placed in the .dgn by Power GEOPAK in a way that they are arranged properly and stacked within sheet borders. Curve Stroking. Stroking is the process of automatically adding shots to the Power GEOPAK terrain model or corridor by interpolating new shots from the curved sections of the data. This distance is used to interpolate new shots along the curved element in corridor processing and applying linear templates. This value is used as a perpendicular minimum distance from chords generated along the arc. Chords are drawn along the arc and the perpendicular distance is measured from the middle of each chord to the arc. If this distance is larger than the Curve Stroking, the process is repeated with a shorter chord length. This process is repeated until the end of the curve is reached. The flatter the curve, the fewer number of points will be calculated. The steeper the curve, the greater number of points that will be calculated. Datum. See Horizontal Datum and Vertical Datum. DDB File. GEOPAK file (Design Database) which contains features definitions, associated symbology and annotation settings. Delta Terrain Model. A surface containing data derived from the difference in elevation between two terrain models or a terrain model and a plane. Downstream. The indicated path follows the steepest descent from a user-defined point through the terrain model terminating at a low point or the edge of the terrain model. Drape. The process of vertically projecting elements onto a surface so that the element elevations are defined by the surface. Drape Void. A closed area of missing or obscured data where the void coordinates are not included in the triangulation. Voids are inserted post triangulation. The void coordinates and lines are draped on the TIN surface. Even though a user must provide an elevation for the Drape Void vertices, the user elevations are changed to the elevation of the TIN surface at the XY Drape Void coordinate position. Drone. An unmanned aircraft or ship guided by remote control or onboard computers. See UAS. Dynamic Cross Sections. Temporary Power GEOPAK cross sections cut on the fly from the 3D Model using the corridor creation tools. They cannot be edited or printed. Earthwork or Earthwork Quantities. Average end area excavation and fill design quantities generated from the cross sections. Construction earthwork quantities can be calculated by average end area or by the surface to surface method. Electronic Design Data (EDD). MoDOT Highway Designers and consultants are required to provide specific file deliverables for the purpose of advertising, bidding and constructing roadway projects. This data is called Electronic Design Data (EDD). Electronic Design Data Checklist. A checklist that is performed to verify the complete delivery of EDD for internal and Design Consultant project. Element Template. MicroStation concept which allows preconfigured definitions for symbology and other miscellaneous display of MicroStation elements and civil features. End Condition. A specialized component of a corridor template which provides information tie into active surface. End Condition Exception. Used to modify the behavior of an end condition solution without requiring the use of additional template drops. When an end condition exception is added, it must be edited to change its behavior. Existing Terrain Model. The existing terrain model is a single layer surface inside a Power GEOPAK .dgn computer file that represents the actual 3D ground features. Feature. A Feature is anything that can be seen or located and is a physical part of your Power GEOPAK design, representing a real world thing. A feature’s definition is one of its properties. At any given time in the design process, the feature will have a Horizontal Geometry, a Vertical Geometry, 3D Geometry or a combination to define its location. examples: curb, pavement,spot dirt, manhole, wall, agg base, R/W marker, ditch, fill slope, etc. Feature Definition. The feature definition typically is a property applied to Power GEOPAK plan view civil geometry. (eg. special ditch, eop, eos) The feature definition is automatically inherited by its associated profile and the derrived 3D geometry. Feature definitions are used by corridors for horizontal feature control. (eg. new pavement will seek "eop new"). Also see Surface Feature Definition. Feature Name. The name given to a Power GEOPAK Feature. See Feature. Fore Slope. The slope typically from the edge of the shoulder to the bottom of the ditch or to the bottom of the roadway fill. Expressed as run: rise. Gap. When a feature is trimmed the part(s) which are invisible on the base geometry. GPK. A legacy GEOPAK database containing coordinate geometry information. The GEOPAK database file extension is: “gpk”. Graphical Filter. Used in developing Power GEOPAK terrain models from Power GEOPAK corridors. Grid Coordinate. A coordinate typically in the State Plane Coordinate System for highway design. Can be in UTM or other system. A grid coordinate not a ground coordinate. Ground Coordinate. A coordinate x,y value in a ground projection (i.e. modified state plane). It is derrived by taking a grid coordinate and multiplying it by a scale factor. This scaling process does not effect the elevation. Highway design, staking and construction are performed using ground coordinates. Horizontal Alignment. A 2D linear feature in Power GEOPAK with a special purpose of defining the centerline or the baseline of a roadway. (aka chain). Horizontal Datum. Horizontal datums are used for describing a point on the Earth's surface, in latitude and longitude or a cartisian coordinate system. The North American Datum 1983 (NAD83) is the most important for highway design and surveying. See Vertical Datum. Horizontal Geometry. The Power GEOPAK elements which define the horizontal layout of the design. These elements are 2D elements even if the DGN model is 3D. Horizontal Geometry may be points, lines, arcs, spirals, splines or any combination in a complex element. Island. A closed area of land, inside a Power GEOPAK terrain model void. i.e., island in the middle of a lake or land inside an obscured area. Key Station. Additional station added to the Power GEOPAK corridor to force processing at the particular location. LandXML. A non-proprietary file format for the sharing of civil data between applications. The LandXML file extension is: “.xml”. Laser Scanner. A LiDAR acquisition device, typically mounted on a tripod, used to collect point cloud information for the purpose of creating an existing terrain model. See LiDAR. LIDAR. LiDAR (Light Detection And Ranging) is an laser scanning technology which scans ground and other physical features to produce a 3D model. Linear Feature. A Power GEOPAK plan element composed of lines, arcs, spirals and splines or a profile element composed of lines, parabola and splines. Linear Stroking. Stroking is the process of automatically adding shots to the terrain model or corridor by interpolating new shots from the linear sections of the data. Linear stroking is measured along the element. Interpolated vertices are added whenever the distance between the vertices is greater than the linear stroking value (in master units). Mapping. A collection of natural and manmade conditions that are surveyed and represented as SS4 Power GEOPAK Survey features in the Bentley .dgn format. MicroStation. See SS4 Power GEOPAK. Mobile LiDAR. A vehicle mounted LiDAR acquisition device used to collect point cloud information while moving for the purpose of creating an existing terrain model. See LiDAR. Modified State Plane Coordinate System. A ground coodinate system that is derrived for a specific project or area by multiplying State Plane Coordinates (n & e but not elev.) by a project projection factor. Design work and constion is performed using a modified state plane coordinate system. See State Plane Coordinate System and Ground Coordinates. Nadir. The point on the ground that is vertically downward from an airborne observer. Online Plans Room. MoDOT's Online Plan Room provides access to contract documents for projects currently in the process of receiving competitive bids. Photogrammetry. Photogrammetry is the science of making measurements from overlapping photographs. Until a few years ago, photogrammetry was used extensively by MoDOT to develop the existing terrain model for projects. That technology has been replaced with LiDAR. Photogrammetry has been reborn as the predominate method of surface creation when using unmanned aerial vehicles (UAV). Plan Model. The usual Power GEOPAK DGN model, used for laying out horizontal geometry. Best practices will dictate that this is a 2D DGN model but 3D DGN model can be used. This is where geometric layouts and corridor definitions are kept. The geometric layouts are not only alignments but also edges, parking, striping, sidewalks, etc. Plan Sheet (.dgn). A Power GEOPAK .dgn drawing file that contains a border. Used to produce a .pdf plan sheet contact document. See Border. Plan Sheet (.pdf). An Adobe Acrobat .pdf file that represents a plan sheet and is a contract document. In other words it contains a border and title block. .pdf files can be electronically signed. Point Cloud. A set of vertices in a 3D coordinate system and are defined the by X, Y and Z coordinates. Point clouds are usually created by Laser scanners, Aerial LiDAR or Mobile LiDAR. These devices measure a large number of points on the surface of an object and output a point cloud as a data file. The point cloud represents the visible surface of the object that has been scanned or digitized. Point Control. Used to modify the behavior of points in a template. These controls take precedence (they override) over existing constraints on the point. Point Features. Defined by a single X, Y (Z optional) location. A point need not be a feature. It may be defined as a non-featurized point by way of AccuDraw, Civil AccuDraw, Snap or a data point. Non featurized points are use to control the construction of Linear Features. Power GEOPAK Corridor. See Corridor. PowerGEOPAK. See SS4 Power GEOPAK. Professional Land Surveyor (PLS) of Record. The professional land surveyor whose signature appears on survey documents or is responsible for the quality of surveying work. Project Control. High precision locations that are located in the field with steel pins or other permanent marker. 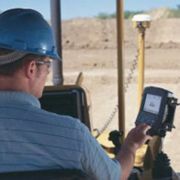 They provide the basis for lower precision surveys and staking on construction projects. Project Data Summary Report. This Excel report, prepared by the designer, gives a summary of all Electronic Design Data files submitted with the project and is an important reference for MoDOT staff and contractors that may use the Electronic Design Data. This file contains specific project information and acts as table of contents with descriptions for all files submitted. Project Explorer. The Power GEOPAK interface for browsing elements in a DGN file. Extended by civil to accommodate specialized civil needs. Projection Factor. The project specific factor that is used to convert state plane north and east coordinates to modified state plane ground coordinates for use in design and construction. Elevations are not multiplied by the projection factor. ProjectWise. ProjectWise is, among other things, a CADD document management tool that provides the ability to check out, open, modify and manage documents to include PDF, DGN, DOCX, and XSLX files. ProjectWise PDF Creation Tool. A ProjectWise tool that produces Adobe Acrobat (.pdf) files to be used as contract plans. ProjectWise Ref Scan tool. A tool that corrects the relationships between the master file and the reference files so they can be managed correctly by ProjectWise. Proposed Terrain Model. A Power GEOPAK terrain model consisting of a triangulated surface that completely describes the design features of a corridor and ties into the existing ground terrain model at its edges. See Terrain Model. Reference Element. The rule for some geometry is a calculation from another element. This other element is the reference element. Reference File. A Power GEOPAK drawing can have other drawings and image files attached to it. Elements in a reference file display as though they are geometry in the active design file. Although you cannot manipulate or delete the elements displayed in a reference file, you can snap to them or copy them into the active design file. Secondary Alignment. Used to modify the direction of cross section processing. By default, as any given station, the cross section is created orthogonal to the main alignment/feature. If a secondary alignment exists, then that portion of the cross section which lies outside the secondary alignment will be orthogonal to the secondary alignment instead of the main alignment. Sheets. Typically Adobe Acrobat (.pdf) files created from Power GEOPAK .dgn files. The plan sheet .pdf files are signed by the Project Manager and are part of the contract documents. See Border. Signed. The term signed indicates that an Adobe Acrobat contract file has been electronically signed by the engineer of record. The PLS Surveyor of record perfroms electronic signatures as well as "wet" signatures as part of their work. Wet signature indicates signing and dating paper plans in ink. SMD File. GEOPAK file (Survey Manager Database) which contains survey features definitions and associated element and textual settings. Special Ditch. A standard ditch has a consistent depth so the bottom of ditch elevations run parallel the edge of the shoulder. The bottom of ditch elevations of special ditches are defined by a profile to control the ditch elevations and can be manipulated by the design to provide a desired result. Spot Elevation. A set of X, Y, Z coordinates representing a point on the terrain model surface. There is no implied relationship between spot elevation points. SS4 Power GEOPAK. Power GEOPAK is a suite of software that includes MicroStation drafting software and GeoPak civil design tools. SS4 (Select Series 4) is the version required for use on MoDOT work. State Plane Coordinate System. One of 124 geographic coordinate systems designed for specific regions of the United States. They rely on a simple x,y coordinate system to specify locations rather than latitude and longitude to allow the use of "plane surveying" methods. Also, the system is highly accurate within each zone. Missouri has three state plane zones: East, Central and West. Control surveying is typically performed in the state plane coordinate system. Design and construction work is not performed in the state plane coodinate system but in the modified state plane coordinate system that is project specific. A project specific grid to ground projection factor is used to convert State Plane coordinates to Modified State Plane ground coordinates. Stationing. Stationing is a system of measurement used for road layout and construction. From the beginning station, and all distances along the roadway centerline are measured from that point using 100 foot stations. The number to the left of the + is the distance in full 100 foot stations and the number to the right of the + is the distance beyond that full station in feet. The station 123+34 is 12,334 feet from the beginning of the alignment. Superelevation. Superelevation is the rotation of the pavement on the approach to and through a horizontal curve. Superelevation Lane. The closed area defined by the Power GEOPAK superelevation tools used for the limits of transition calculations and pivoting location. Superelevation Section. Area along a Power GEOPAK horizontal geometry element, where superelevation will be calculated. Surface File. A LandXML, GEOPAK tin or other file type that contains only surface information. Typically exported by Survey or Design software for use in another system. Survey Coordinate File. The comma delimited Survey Coordinate File is prepared by the project’s Professional Land Surveyor of Record and contains project control points. Survey Report. The Survey Report is prepared by the project’s Professional Land Survey of Record. It is used for documenting the project control metadata and the method in which the topography and terrain information is obtained for a project. Target Aliasing. Used to create the desired results when working with multiple surfaces without having to edit the template from the template library. Target aliases can also be used so that one corridor can target the solution of another corridor. Template Drop. An area (usually defined by station limits) along a corridor to which a specific template is applied. The template drop spacing is determined by the designer to provide the accuracy required for the surfaces. Template Library. A Power GEOPAK file that stores definitions for templates, generally with an ITL file extension. Template or Civil Template. The configuration in Power GEOPAK that defines the cross sectional shape of the roadway being modeled. This cross-section is then “extruded along” a 3D geometry element to form the final model. The corridor template can create or target features such as road edges. The result is the creation of a corridor. Template Transition. MoDOT does not currently utilize template trainitions. See Parametric Constraints. Terrain Model. A Power GEOPAK three-dimensional DGN element defined by spots, break lines, voids, holes, contours to model a surface on the earth. The terrain model replaces the .tin file format used before Power GEOPAK SS3. Topography. A detailed description or representation on a map of the natural and artificial features of an area. Topolift. A laser scanner mounted on a pickup that is composed of a lift and bridge mechanism. The automated lift operation substantially reduces the drive, stop and setup time compared to tripod-based operations as well as adding additional height for better coverage. The scanner is completely isolated from the pickup during scans. Trace Slope. Upstream - The indicated path follows the steepest ascent from a user-defined point through the terrain model terminating at a high point or the edge of the terrain model. Traditional Survey Methods. Traditional surveying includes the use of GPS, total stations, leveling, bathymetry, etc. UAS. Unmanned Aerial Systems (UAS) is an all encompassing description that encapsulates the aircraft or UAV, the ground-based controller, and the system of communications connecting the two. UAV. An unmanned aerial vehicle piloted by remote control or onboard computers. See UAS and Drone. Vertical Alignment. A linear feature in a Power GEOPAK profile model with a special purpose of defining the elevations of an alignment. Vertical Datum. A vertical datum is a surface of zero elevation to which heights of various points are measured. The vertical datum can be based on sea level (obsolete), an ellipsoid or a geoid model of the earth. The North American Vertical Datum of 1988 (NAVD88) is the current vertical datum for highway design and surveying. Plans produced prior to 1988 and during the transition period were typically based on the National Geodetic Datum of 1929 (NGVD29). See Horizontal Datum. Vertical Geometry. The elements which define the vertical layout of a corresponding horizontal geometry element. These vertical elements are 2D and are stored in a profile model. Void. Closed shape representing areas of missing data or obscure areas. No point or break data located within the void area is utilized and no triangles are created inside the void areas. The Void coordinates are included in the triangulation and void lines between successive void coordinates are inserted as drape lines on the surface. Therefore, they do not change the slope or elevations of the surface. Watershed. Defined by either a low point within the terrain model or a low edge point along the terrain model edge, it's the closed area wherein all water would drain to the low point. Workspace. A workspace is a Power GEOPAK environment or configuration. Organizations establish a standard workspace to help users comply with standards and increase production speed. It also helps reduce errors caused by using incorrect resources such as fonts, text styles, line styles, seed files and dimension styles. This page was last modified on 25 July 2018, at 08:05.